Since the announcement of GST, there is a constant tussle going on between GST pros and others on its effects on the economic growth of the country. While the contention can go on, one thing that is truly revolutionary in the entire gig is the introduction of Input Tax Credit (ITC). The ability to claim ITC on your purchases, has made the reconciliation of your purchase data with your suppliers’ data extremely crucial. Though, the process is a carry forward of VAT and excise days, the stringent monitoring of ITC claim in GST regime calls for flawless reconciliation. So, what is reconciliation? For beginners, reconciliation is a process to match the data reported by all your suppliers of your procurements during a given period with your purchase data for that period. Your vendors upload their outward supplies through GSTR1 on GST system. The system aggregates all your inward supplies from the GSTR1 of all your suppliers and auto-populate it for you as GSTR2A. While the idea was to have the reconciled inward supplies data filed through GSTR2 within 5 days’ time, same was revoked in the initial days itself. Since then, you as taxpayer need to reconcile the 2A with your purchase data before submitting your GSTR3B to claim ITC. GSTR3B is a consolidated report on your inward and outward supplies and the ITC calculations. Sounds Simple, isn’t it! Not when you have hundreds of vendors with thousands of invoices being generated per month! Why regular GST Reconciliation is critical? The Annual Return Form Filing cannot happen without reconciling all your purchase data with your suppliers’ data for the given period. The return filing is now due on June 30, 2019 as per the recent extension announced in the 31st GST Council Meeting. Hence, it becomes extremely important to reconcile your data regularly to avoid last minute hassles. The GST system does not allow rectification of returns filed. 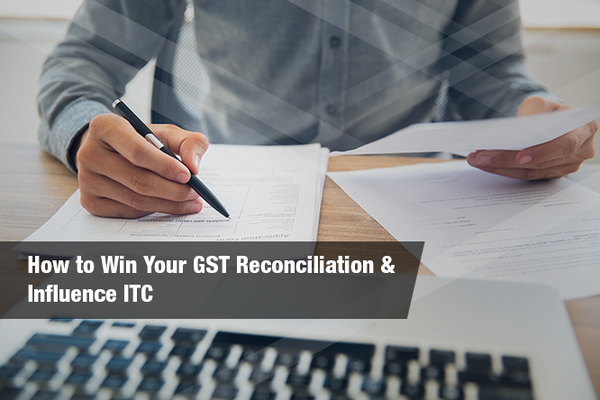 Hence, if the data is not reconciled in time, it becomes difficult to claim or pay excess ITC, as the case may be, in subsequent months through amendments. For e.g., your vendors filed their GSTR 1 on 10th of January 2019 for their December 2018 Outward Supplies. And your 2P (Purchase data) for December 2018 did not match with the GSTR 2A received from the portal. However, the reconciliation did not happen before the filing of GSTR3B on 20th January 2019. In such scenario, you cannot rectify the January GSTR 3B, but file an amendment in the next month, which is February 2019 for those invoices. This tedious process of amendment filing also makes reconciliation a very important step to be done regularly. The reconciliation process involves identifying mismatches, communicating with your vendors, sorting out differences and reviewing the final data. Moreover, this has to happen at PAN level, for all your GSTINs, which may involve multiple vendors spread across geographies, multiple users and dependency on GST systems. Thus, a regular reconciliation process becomes critical. But, as they say it’s easier said than done. In real world, it would require the taxpayer to manually locate the mismatching invoice in tonnes of data for various GSTINs separately. Furthermore, the taxpayer would have to trace the errors through a colossal list of invoices (which can be as minute as faulty date entered) and aggregate the data vendor-wise. Then recurring communications needs to happen between multiple vendors to sort out the differences making it backbreaking chore, nonetheless still being time consuming and liable to further manual mishaps. Fret not! With IRIS Sapphire’s New and Advanced reconciliation, the process becomes easy, quick and out of the ordinary. IRIS Sapphire frees you from the burden of manually matching your data with suppliers’ data, as you can bulk upload all your invoices across GSTINs and the smart reconciliation module automatically matches your purchase data with GSTR 2A from the portal to give you well-bucketed mismatch results. Review the mismatches and update directly to GSTN. You can even connect with your vendors from the portal itself and ask for rectifications. In addition to this, you can further go for user-triggered Advanced Reconciliation, which runs deeper algorithms to find matches across Financial Years, use fuzzy logic to contravene certain characters from the invoice no. match criteria and also compare invoices based on values. Vaishali Dedhia, a Chartered Accountant, has been working with IRIS for over 7 years and is currently the lead Functional Analyst and Subject Matter Expert for IRIS' GST offerings. She has also been assisting the clients in return filing related queries. Prior to GST, she was involved in compliance and data analysis for the US markets. In her leisure time, Vaishali likes reading novels, listening music and hanging around with friends, family.